Jupiter in 6th house till mid July and then in 7th house, Rahu in 8th house, Ketu in 2nd house and Saturn in 10th house throughout the year together determine the major transit results this year. 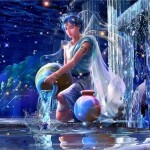 Saturn is located in your 10th house, the house of profession and career. Last year you might have been seeking spiritual solace, but during this year, Saturn will ensure that you must concentrate on your career and how will you earn your day to day livelihood. The 7th house Lord, Sun is located in your 11th house, the house of income and gain. You may be able to create successful partnership with powerful men who will be supportive in your profession and career. But this year will be challenging financially for you and you may not get full reward for the efforts that you will be putting in your profession and career. Saturn is also located in 8th house from moon in this year�s chart. There may be karmic setbacks over which you may not have any control. Do not try to be very proactive during this year. Remain focused and just fulfil your minimum duties and responsibilities during this year. Health : Saturn the ruling planet for this year aspects its own sign or the ascendant thereby strengthening it from the 10th house. Your 1st house which is very strong and powerful signifies that you will enjoy excellent health during this year. At least on this front, you have nothing to worry during this year. But Rahu is located in your 8th house, there may be unexpected accident or some serious ailments during this year but there is no point in worrying about it because it is karmic and simply beyond our control. Finance: There may be some ups and downs in financial fortune during this year. There may be financial disputes or difference of opinions in the family in connection with joint property or joint investment. The month of August /September will be favourable for new investments. Education : The first half of the year is not very good for the students. There are low chances of getting the desired results in competitive examinations. Therefore, do not be careless in anything. There are chances of getting success after the month of July. It is the right period to take admission in a new course. There will opportunities to study in a place far away from your home town. Career : Lord of 10th house, the house of Profession is Mars which is exalted in your 12th house. You will be more successful in whatever efforts you put which involve a foreign connection, foreign opportunities and multinational corporations.The month of January will be most favourable and auspicious. But you may expect some major setbacks in the month of March which may be completely unexpected and frankly speaking, beyond your control. However please do not lose your hope and continue to make efforts. Those in jobs should try to pre judge the potential of new activities before starting the work indiscriminately. This way you may save a lot of your physical and mental energy from being washed away with the projects which will be scrapped after a few months. You may also feel uncomfortable working with some of your colleagues as you are likely to form some prejudices against them. Be warned that this will affect your decision making unnecessarily. Therefore, get rid of the negativity to improve your work surroundings. The chances of transfer or re-location are not very strong. After July 2015, the chances of finding a new job improve significantly. Interestingly, you may get the lead or support from someone known to get you a job. During the first 6 months, budget your expenses judiciously to sail through the year smoothly. As a relief, you can hope to get some financial contribution from your spouse (in case working) after mid July. Possibilities of alternate sources of income exist after mid July. This year is more suitable to focus on existing activities rather than any plans of expansion of business. Small and medium sized business persons and self ? employed professionals are expected to be working very hard this year, even setting examples for others to follow. During November – December, avoid taking any extreme decisions to bring about drastic changes in work place or business. The period after July is good for building up your contacts. Which are likely to contribute a great deal in the further progress of your career. Family : There will be encouraging atmosphere in the family. You will be blessed with son. You will get auspicious news from your children. There are possibilities of decrease in health of your father. You will get the cooperation of your mother. Weiward attitude of your co-borns may give you tension. Married life will be happy. You will feel happy on the abilities of your spouse. You will have affinity with your family. There are possibilities of differences with your friends. You will be honoured in society. Travel : Jupiter�s aspecting on the 12th house and on the aspecting Saturn, in the first half of the year creates opportunities for a long foreign trip. For people in service, there are strong chances of transfer of work place. This transfer will prove beneficial for them. Romance & Married life : This will be a mixed year for marital stability and happiness because of placement of Ketu/Rahu axis between 2nd house/8th houses. You must try to maintain the maximum harmony with your spouse /Life partner.